Stop right there! I know what you’re thinking. Oh, here comes Microgaming with another Oriental-themed slot to follow the likes of the well-received Asian Beauty slot and the rather bland Oriental Fortune slot. Yes, it is also another Microgaming slot that has the word “lucky” in it. Don’t dismiss this slot quite yet! Ok, so it does appear that there is not really anything mesmerizing about this slot release from online slot developer Microgaming but it is still worth checking out. 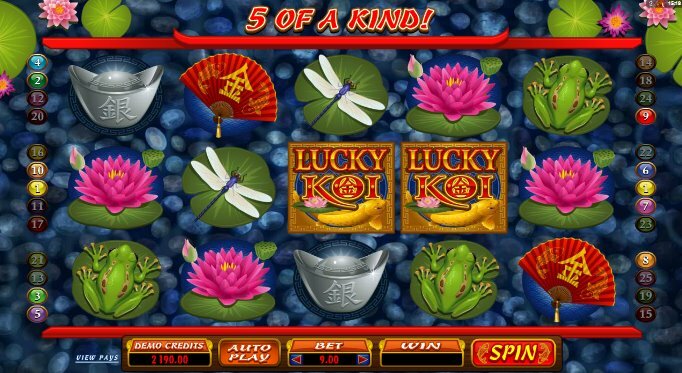 This 5 reel, 25 pay-line slot has all the usual Oriental symbols including lotus flowers, different insects on lily pads, an Oriental fan and some random Oriental ornaments. The Lucky Koi Have Gone Wild! 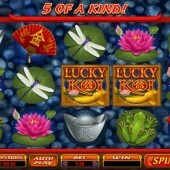 The Lucky Koi logo acts as the Wild on this slot and substitutes for all other symbols except for the Scatters in order to complete winning combinations and increase your chance of hitting some wins. The Oriental garden symbol represents the Scatter and this is the symbol you will need to hit three times or more across the reels to trigger the Bonus Choice feature where you can choose to begin a free spins bonus round or the Koi Bonus. If you opt for the free spins bonus round then you will be awarded with 10-30 free spins, depending on how many Scatters you triggered the bonus feature with, and you can also earn up to a 5x multiplier. If you decide to go for the Koi Bonus then you will be taken to a second screen. You will be transported to an Oriental garden where you will be asked to choose between three and six Koi, once again this depends on how many Scatters you triggered the bonus feature with. Each Koi will then reveal a bonus prize so this essentially acts as a Pick ‘em Bonus. That is it for Lucky Koi. Some of you might be rolling your heads and thinking “this is just the eerie Lucky Witch slot but in Oriental form” but there are others who might be taken by the attractiveness of having the choice of free spins or a Pick ‘em Bonus. It isn’t the worst slot release I’ve played by Microgaming but I can see why it wasn’t exactly highly publicized. If you wanted your everyday average slot then you will find it right here. It’s reliable and will give you some thrills but don’t expect to rate this in your top 10 slots of all time.